Police officers, on show last Friday night, showed that they are not just good at law enforcement, but also at entertaining. 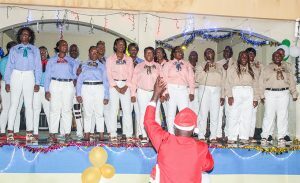 This, as the Royal St Vincent and the Grenadines Police Force (RSVGPF) held their annual Police Credit Union – Police Christmas Caroling Contest. Keenly contested, ‘Fire Busters’, the songbirds from the Fire Department took the top spot in the senior category of competition. 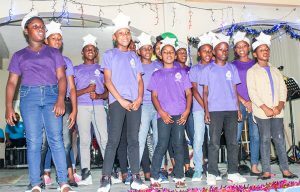 Lighting up the competition, which was held at the Central Police Station, ‘Fire Busters’ out-sang seven other groups with their traditional song “Gloria in Excelsis Deo” and their original song, “Christmas Bacchanal”. In second place was ‘Traffic Angels’. 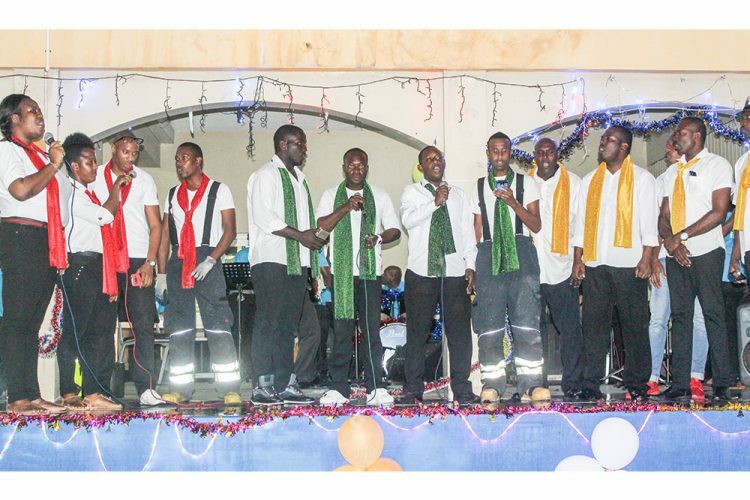 They retained this position with their traditional rendition of “Comfort and Joy” and their energetic, creative original song “Pull Down Crime for the Christmas”. They were the crowd favorites, and every one thought they had won, but the judges proved the crowd wrong. The senior competition saw in third position, ‘CPS Blasters’ who sang “Christmas Hallelujah” and “Santa Gone Santa Still Dey”. The other competitors in the senior category were ‘Port Carolers’, ‘Crime Bakers’, ‘Coast Guard Carolers’, ‘Auxilliary Carolers’ and ‘Cadet Carolers’. For winning, ‘Fire Busters’ received a cash prize of $700, a trophy and one case of Vita Malt. The trophy for Best Carol went to ‘Fire Busters’; ‘Traffic Angels’ received the trophy for Best Original Song, the Best Speech was awarded to ‘CPS Blasters’ while ‘Auxiliary Carolers’ received the trophy for Best Turned Out Choir. Auxiliary Carolers’ received the trophy for Best Turned Out Choir. 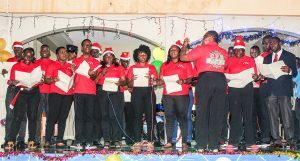 In the junior category of competition, the ‘Sandy Bay Police Youth Club Carolers’ received the top prize of $350, a trophy and one case of Vita Malt. They took the junior category win singing “Oh Little Town of Bethlehem”. The junior choir competition saw in second place, ‘the Paget Farm Police Youth Club Carolers’ with “Noel” while ‘the Petit Bordel Police Youth Club Carolers’ took the third position with their rendition of “Oh Come All Ye Faithful”. The other competitors in the junior category were ‘the Questelles Police Youth Club’, ‘Georgetown Police Youth Club’, ‘Chateaubelair Police Youth Club’ and the ‘Barrouallie Police Youth Club’. The competition was held under the theme, “Tis the season for Mirth and Merriment”. Guest artistes were The Bowmans, Man Zangie, Cleopatra, Luta, and Avenue Dancers. It was the first time in its 15-year history that the contest was shown live online and on television. This was made possible through newly formed partnership with Stv Online and VC3 TV. Sponsors included the Police Cooperative Credit Union (PCCU), Standard Caribbean Shipping Inc, Global Distributors, Facey Trading, Allan Smith Family Bakery, M. Moussa and Sons, Stv Online, VC3 TV, SVG Brewery, FLOW (SVG) and Sportslocka Plus. Commissioner of Police (COP) Colin John thanked the patrons and everyone who contributed to the successful hosting of the event.